In this lesson, we will learn how to use derivatives that identify the location of maximum and minimum values to optimize quantities in models. 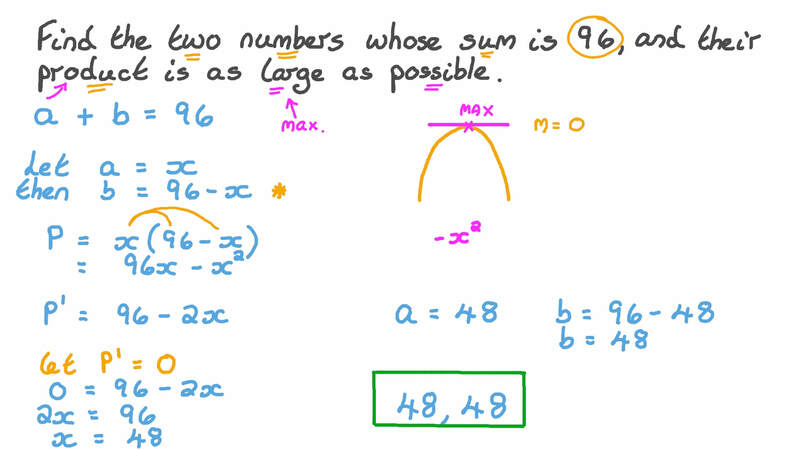 Find the two numbers whose sum is 96, and their product is as large as possible. Find two numbers whose sum is 156 and the sum of whose squares is the least possible. 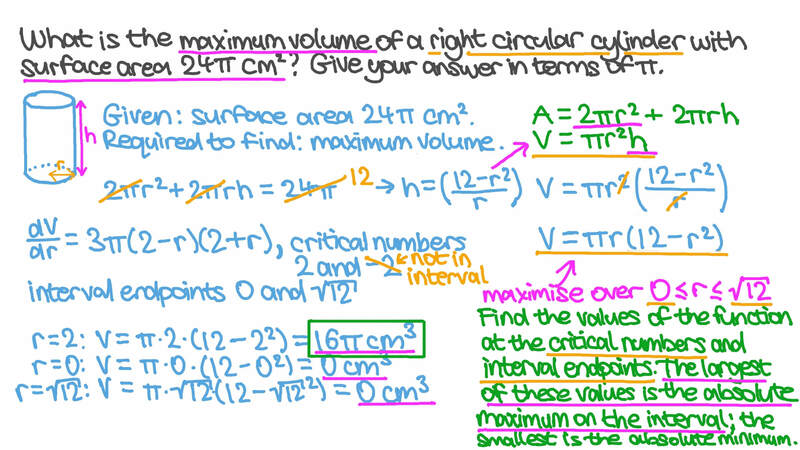 What is the maximum volume of a right circular cylinder with surface area 2 4 𝜋 cm2? Give your answer in terms of 𝜋 . The sum of the sides of a rectangular parallelepiped having a square base is 12 cm. Find the dimensions that maximize the volume. A farmer wants to create a rectangular field on his land using an existing wall to bound one side. Determine, to the nearest thousandth, the maximum area he can obtain if he has 177-metres of fence to surround the other three sides. Given that the volume of a hot air balloon grows according to the relation 𝑓 ( 𝑡 ) = 7 , 0 0 0 𝑡 𝑡 + 4 9 + 4 , 0 0 0  , where the time is measured in hours, determine its maximum volume. A window is made of a semicircle on top of a rectangle, with the semicircle’s diameter equal to the rectangle’s width. Given that the window’s perimeter is 30 m, determine the semicircle’s radius that maximizes the window’s area. Find the points on the curve 𝑦 = 2 𝑥 + 2 1 2 that are closest to the point ( − 6 , 0 ) . A rectangular piece of cardboard paper has two dimensions of 10 cm and 16 cm. If congruent squares of side length 𝑥 cm are cut from its four corners, and the projected parts are folded upward to form a box without a cover, calculate the dimension of the formed box when its volume is as maximum as possible. Find the dimensions of the rectangular corral producing the greatest enclosed area given 200 feet of fencing. A rectangular corral is split into 3 pens with identical dimensions. Given that 500 feet of fencing was used to construct the corral and it was designed to have the maximum area possible, find the dimensions of the corral. A sector of a circle has area 16 cm2. Find the radius 𝑟 that minimises its perimeter, and then determine the corresponding angle 𝜃 in radians. A vertical cylindrical silo of capacity 3 8 4 𝜋 m3 is to be built with a hemispherical domed top. If painting the dome costs three times as much as painting the sides, what dimensions will minimise the painting cost? What is the maximum area of an isosceles triangle inscribed in a circle of radius 47 cm? Give your answer to the nearest hundredth. Given that the sum of the surface areas of a sphere and a right circular cylinder is 1 0 0 0 𝜋 cm2, and their radii are equal, find the radius of the sphere that makes the sum of their volume at its maximum value. A rocket is launched in the air. Its height, in meters, as a function of time is given by ℎ ( 𝑡 ) = − 4 . 9 𝑡 + 2 2 9 𝑡 + 2 3 4  . Find the maximum height the rocket attains. Find the dimensions of a cuboid of volume 1 000 cubic meters which has the least surface area. A ladder leans against a building and also touches the top of a fence. If the fence is 6 m high and 6.25 m away from the building, what is the shortest ladder that will do? Give your answer correct to the nearest thousandth. A farmer finds that if she plants 75 trees per acre, each tree will yield 20 bushels of fruit. She estimates that for each additional tree planted per acre, the yield of each tree will decrease by 3 bushels. How many trees should she plant per acre to maximize her harvest? A rectangular box with a square base is going to be built and it needs to have a volume of 20 cubic feet. The material for the base costs 30 cents per square foot. The material for the sides costs 10 cents per square foot. The material for the top costs 20 cents per square foot. Determine the dimensions that would yield the minimum cost. A right circular cylinder is to have a volume of 40 cubic inches. It costs 4 cents/square inch to construct the top and bottom and 1 cent/square inch to construct the rest of the cylinder. Find the radius which would yield the minimum cost, rounded to one decimal place. A cuboid-shaped box has a square base. If the sum of all its edges equals 792 cm, calculate the dimensions of the box that will maximize its volume. A rectangular-shaped playground ends in two semicircles. Given that the perimeter of the playground is 594 m, determine its maximum area. A right circular cylinder without a top has a volume of 50 cubic meters. What is the radius giving the minimum surface area? A wire of length 41 cm is used to make a rectangle. What dimensions give the maximum area?